Hawk Bird Scarer s effectively protect fruit, nut, berry and broad acre crops by playing on the instinctive fear that birds have of hawks and subsequently scaring them away. 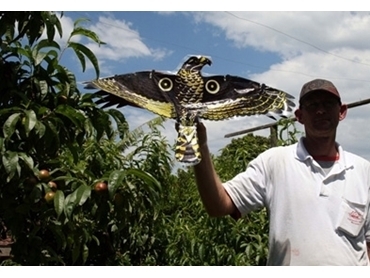 The bird scarers are life-like replicas of hovering hawks and they can be used by orchardists, gardeners, berry growers and farmers. Extremely durable and inexpensive, the bird scarers are maintenance free and do not negatively affect the environment or harm the birds. A number of species of bird have been effectively scared away by the bird scarers, from cockatoos destroying western red cedar homes and roosting pigeons on rooftops through to swallows roosting in buildings and Galahs eating crops. The bird scarers have been used in various different locations, and can also be used to protect clotheslines, television antennas, vegetable gardens, pet food areas and fishponds from birds. The bird scarers come equipped with an instruction manual and free 24 page booklet that contains information about bird scaring techniques. A money back guarantee is provided to those customers who are not totally satisfied with the bird scarers.